Justin Bieber spent some quality time with the Stanley Cup on Tuesday, but even that moment didn't pass without a bit of controversy for the embattled pop star. Bieber was in Chicago to perform at the United Center Tuesday night, and was invited to the Blackhawks locker room to pose with the trophy. Hawks marketing executive Peter Hassen tweeted a picture of "The Biebs" -- who is Canadian and a huge hockey fan -- posing with the Cup in front of a Blackhawks jersey with his name on the back. The photo provoked immediate outrage among many Hawks fans on social media, upset that Bieber was allowed to hang with Lord Stanley. Some Blackhawks fans are upset because Bieber was dressed too casually and wearing shades while in the prescence of the Stanley Cup, others are simply not fans. 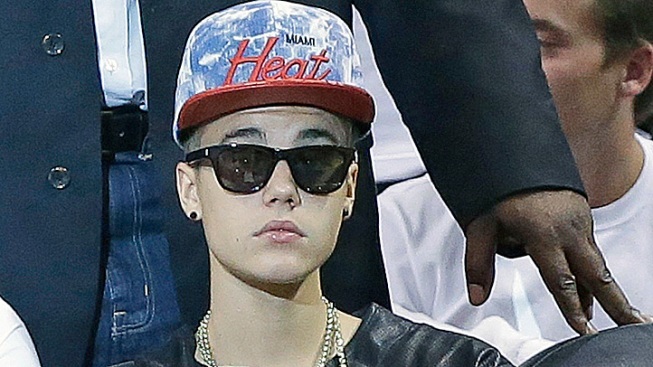 But Bieber is also taking flack for jumping on the Hawks bandwagon, because he was seen wearing a Boston Bruins hat before the Stanley Cup playoffs, and for standing on the Blackhawks Indian Head in the locker room, a definite superstitious no-no among the players. Obviously, Blackhawks fans are protective of their Cup, but Bieber is a 19-year-old millioniare who's protective of his fans in whatever city they may be in. He's a self-proclaimed Toronto Maple Leafs fan, but has been seen wearing the gear of every other team imaginable, including the Bruins and Blackhawks. After all, fans in those cities pay good money too.